Below left is a photo of the front panel design that I have collaborated with Richard Brewster. This is the first time I have used the thinner 0.2mm widths for a FrontPanelExpress panel. It came out much better than my previous 0.4 mm designs. 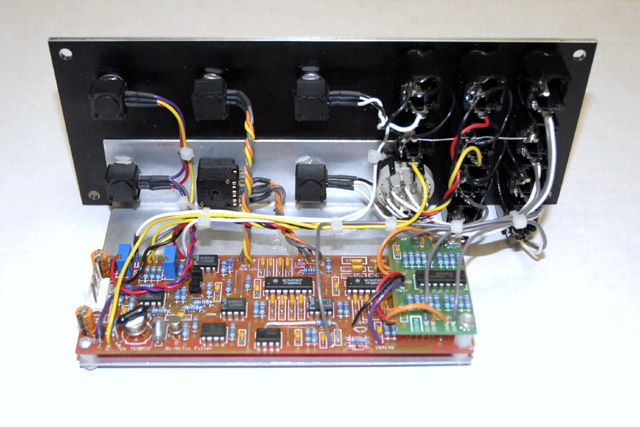 This design incorporates the CGS-56 Gate Converter to bring out the four sub-octave outputs. A 4 position switch selects one of the 4 outputs to be attenuated and fed back into the filter. This filter can generate some great effects! I made the bracket out of aluminum to fit the CGS pcb and provide clearance for the jack just below the rotary switch. This photo shows the completed module with the Gate Converter PCB. 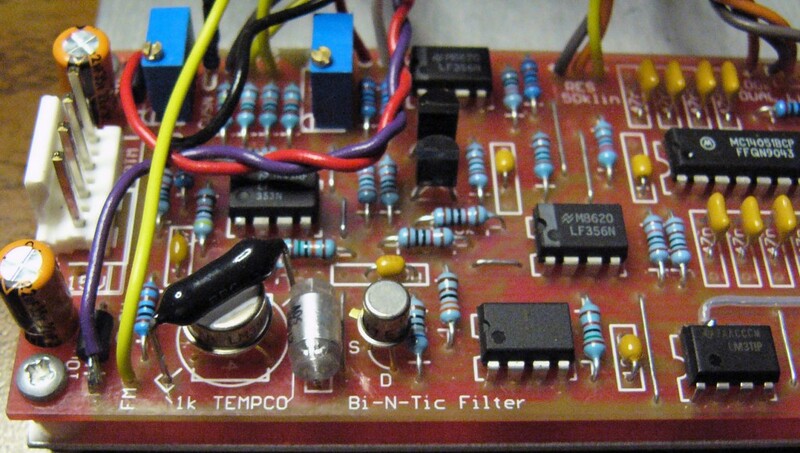 Originally, I built this module with an MPF102 FET. The waveform on the output of the CA3140 had limited voltage swing of approximately 1 volt pk-pk which was insufficient to drive the 4024 clock buffer transistor. I replaced the MPF102 FET with an NTE466. The package is a TO-18 but will fit on the pcb rotated. This FET operates correctly and provides the full 5 volt waveform on the output of the CA3140. The operating frequency of the VCO is 0.57 Hz to 100 KHz. I changed the input resistor on the fine control from 1M to 2M2 to have less range. The clock driver consisting of the capacitor, two resistors, diode, and transistor would not function on the lower signal output nor would it operate below 5 Hz. I replaced this clock driver with a simple level shifter operated from the comparator output. This provides a well defined clock to the 4024 under all operating conditions. This modification required one floating resistor and two jumper wires on the bottom of the pcb. Richard Brewster later posted a message about the 1N4148 diode being in the wrong place on the pcb layout. I didn't verify this on mine but it is worth checking out. It's in message 2164 in the CGS Yahoo group.